Code Compliance has been one of the biggest issues in the spray booths industry. Many US based Spray booths that do not meet the code are being sold and installed in Canada. Spray booth manufacturers need to know that there is a specific criteria to be met when selling in Canada. Gas train components on powder ovens, Control Panels, All motors and lightings must have an accredited certification body mark to comply. Air replacement units must have a remote reset on the Air Make-up Unit. Per new ordinances in Ontario, paint mix rooms must be fitted with fire dampers at intake and exhaust locations (1hour minimum rating). All motors must carry an accredited certification body rating for code compliance. All air replacements must comply with ANSI Z83.25/CSA 3.19. All other replacements that are only used for ambient heating must comply with ANSI Z83.4/CSA 3.7. Paint booth exhausts must be fitted with an air proving switch to ensure exhaust is operating correctly. The painting will be shut down, if there is a failure. Intake Damper on outdoor mounted air replacement units must be provided, per new ordinances in Manitoba. 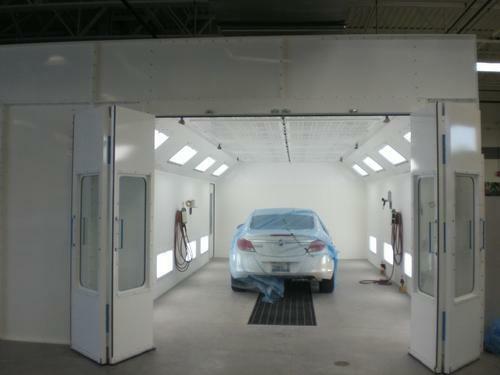 Both Paint booth owners and manufacturers need to be aware of the items listed above before purchasing and installing any equipment. Ensuring that the equipment complies with the local regulations and meets the requirement of the applicable safety standards & codes will prevent and reduce the risks associated with the use of such equipment. Choosing a certification body that has been accredited by an accreditation body that is a signatory member of the IAF (International Accreditation Forum) ensures that products have been impartially tested by a competent and consistently reliable third-party and meet the appropriate standards.